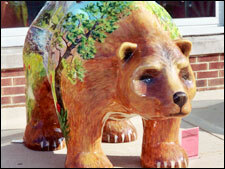 Mary Chisak designed and painted National Penn Bank’s New Hanover Bear Fever bear. 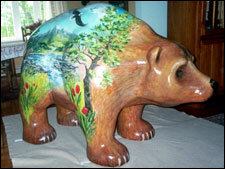 One side of this bear presents imagery from nature in the eastern half of the United States; the other side presents imagery from the western half of the country. Mary received a Bachelor of Fine Arts from Kutztown University where she concentrated in drawing and printmaking. Recently, she especially enjoys landscape painting and her favorite medium is acrylics. 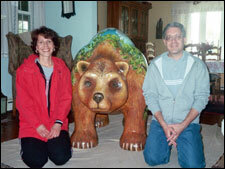 She is a member of the Pottstown Area Artist Guild and her work can be found at Gallery on High Street in Pottstown, PA.